Which are the top beauty YouTube channels in Malaysia? We reveal the list of top 10 beauty YouTubers and OMG they are so talented! Beauty is always one of the favourite topics for video content creators so it is pretty competitive, one has to be really good in makeup at the same time creative to stand out from the crowd. Just take a look at Pony, the K-beauty makeup artist with more than 4.8M subscribers on YouTube with international reach, she's definitely an icon for beauty YouTubers. The question is, do we have our own version of Pony in Malaysia? 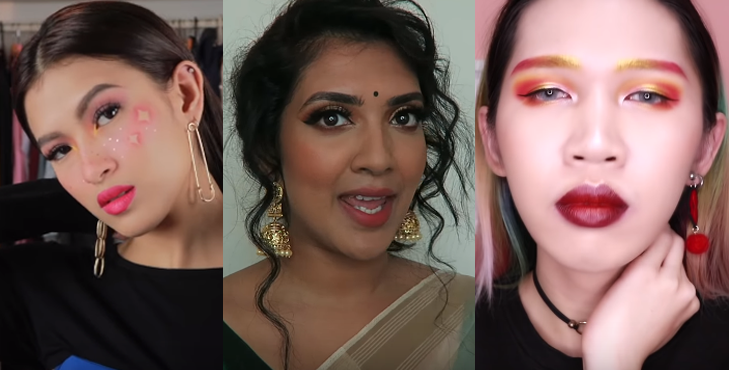 Without further ado, let's find out who are the top beauty YouTubers in Malaysia by the number of subscribers. They are so talented that you'll hit "Subscribe" without hesitation! If you're an anime fan, you'll squeal happily at how accurate zWinnieYap recreates anime characters' makeup. Just check out this videos of hers recreating Hatsune Miku's eyes. Whether you're looking for makeup inspiration for a date or for an artistic look, Asyalliee's got you covered. Be inspired as you watch this beautiful Youtuber create her Fairy Doll makeup look. The only male in this list but no less talented. Anima shows unconventional makeup styles which are definitely worth a watch, especially if you're into horror. Yvonne first became famous for her vlogging about her travels with travel entries and challenges. But her makeup videos are equally popular as well, as you can see by her 5 minute makeup video. All new saree-wearers will rejoice once they see Vithya's videos. She showcases many tutorials on wearing a saree and the perfect makeup to go with each saree. A pretty shawl deserves a pretty makeup look, and Aisha demonstrates it through her makeup tutorials. Plus, you don't need 14325 products just to accomplish the same look in her videos. Don't watch Johanis's videos if you're in a quiet place. Her sense of humour will definitely make you burst into laughter, probably at the wrong timing. In the past, it was super difficult for Asians to find makeup tutorials for their unique facial features. And that's when Emily decided to create tutorials that helped in countering this issue. Not everyone loves putting on a ton of makeup. Master the no-makeup makeup or also known as everyday makeup with Putreeo's tutorials. Well-known for her skin journey, Faa Firds shows that with the proper care, anyone can have great skin. Take a look at her skincare routine that performed miracles for her. If you're looking for something quick to watch, then check out this channel for genuine beauty reviews. Note: All subscribers count for each YouTuber is taken on 12 March 2019. Have we missed out any? Please leave a comment below and let us know! How to advertise on TikTok Malaysia?